I have looked at the book, The Artist’s Way by Julia Cameron, many times in my local White Rock bookstore. I have picked it up, flipped it over and read the back summary. Then put it back on the shelf, so close to buying it many times. I’ve had excuses lingering in my mind. Money was tight. How could I add more books to my life, when I was actively getting rid of books. Some bought on a whim and never read, others acquired on impulse and abandoned after a few pages. All these testaments, to my need for filling up the bookcases of the library I had created in my house. Then one day, something about the words on the outer cover, or maybe even the inner fold, made me take the book about creativity to the cash register. There was a glimmer of promise in the description of what lay inside, The Artist’s Way. It might have been the first key habit prescription of the morning pages. I thought to myself, yes. Of all the things I can do, it is to hand write 3 pages, first thing in the morning. The book came home and sat on my night table, for months. I had other books on the go and knew that I needed to take action as I read The Artist’s Way. It was not meant to be a passive read. The longer it sat there on the bottom of the pile, the more I began to regret buying it. After all, our year-long trip was coming up and I couldn’t very well be lugging paper along with me, around the world. Through dedicated effort, I managed to read the first couple of chapters and fully understand the exercise of the morning pages. I bought a couple of journals and started. I threw the book into my bag with the intention of reading it somewhere along the way, during the summer, then leaving it in Alberta. I managed to read about 2/3 of the book before I left Canada. I circled a bunch of phrases in pencil, wrote some margin notes. The text is really meant to entice action, which I didn’t feel ready to take. I wanted to do all the exercises, but I felt other priorities pulling at my attention. There was always something I needed to do, a place I had to go. I never had enough time, but for the life of me I can’t recall what was keeping me so busy. Through it all, the only thing I managed to do was write the morning pages. They became the one habit I wouldn’t compromise on. I have filled the first 2 notebooks, purchased at home, and recently started a new one, bought in Barcelona. I often find myself wiping sleep from my eyes as I write, first thing in the morning. There is no great significance to anything I have written so far. Yet, I find the words laid down to be precious. Nobody is meant to read any of it. Including me. Much of what I leave in my notebook is the equivalent of dust bunnies. I take those pesky bits of thoughts, floating around in my mind and carefully place them on the page. Describing them as accurately as possible, but scattering their structure at the same time. Once each grain of dust is laid down, on its own, there is no form anymore. The power of these errant thoughts cannot cluster together, causing me frustration. The act of spreading them out, through my pencil, across the page, in neat rows, is the best therapy I have ever known. I am writing down anything that is in my mind, first thing in the morning. Sometimes it is painful. Other times it is hurtful, to me or to others. It can be nasty or boring. Lately, what I find is more joyful and calm. The angst of many past mornings seems to be fading into the background. Julia says, you will grow bored of repeating yourself over and over. Then one morning, your thoughts move on. As a person who spends a fair amount of time writing already, I wondered if I had the energy to take on these morning pages. I worried that some of my best thoughts would get used up in this process. After many months, I am sure that has not happened, even once. For what I leave in my morning pages journal is more of a record. It is the state of my mind on that morning. A kind of, train of consciousness, for what my soul is feeling. It is like describing how much a mosquito bite is bothering me. Instead of continually wandering back to that irritation, I am better able to move on. This probably sounds, ‘out there’, for anyone who has not tried this practice. 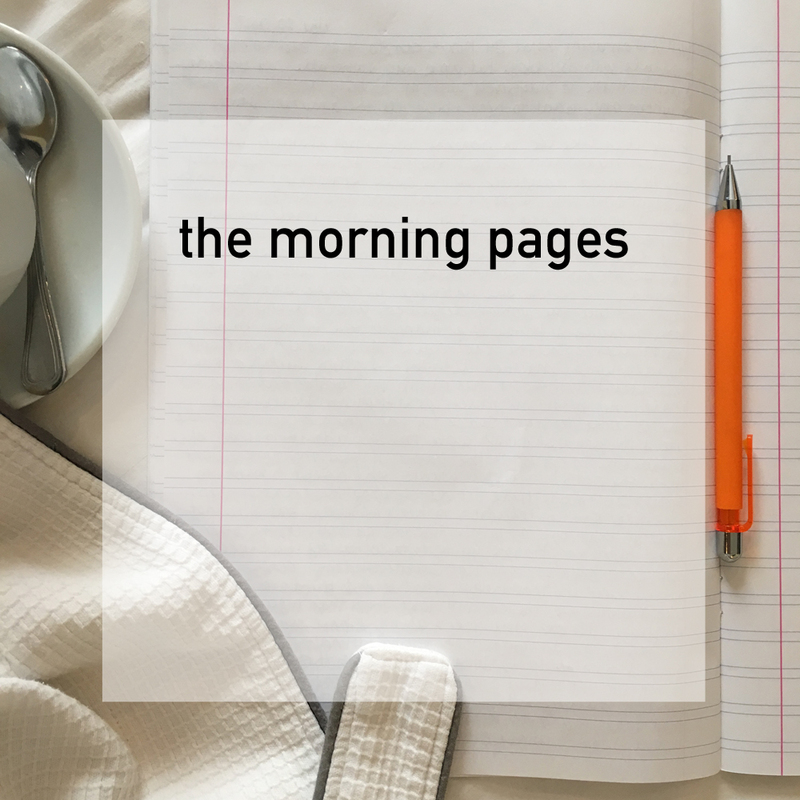 I think everyone will experience the morning pages differently. Even as I write these descriptors, it seems hollow somehow. Maybe I don’t understand the benefit in a proper, psychological way, but I am sure it makes me feel good. I am less likely to blurt out something I will later regret. I even catch myself and think, ‘I left that in the morning pages’, no need to bring it up again. For those that know me well, the first thought might be, ‘maybe you can up the dose?’ I think the small progress I am noticing might not be so evident to my children or husband, whom I am spending the most time with. They might wish an acceleration of this positive effect, if they notice the change at all. Patience. It will come. I think this kind of journalling is a bit different. There is no point to it, in the classical sense. I am not tasking myself to write anything productive or profound. I’m not meant to glean any insights, immediately. There is no point to read it over and analyze any of it. It is truly ‘mental flossing’, as Julia has described the process. I find a huge satisfaction with metaphors of cleaning and flossing. I like getting gunk our from between my teeth. I like hearing the tinkling of stuff being sucked up the vacuum. If the morning pages has the potential to clear up my mind, first thing in the morning, 3 pages is the least I can do. As we continue on our travels, I am aware of an ever deeper sense of gratitude forming. For it is in the constant motion and the reality of not going home, that I feel a deeper connection to those around me. We are trying, as much as possible, ‘to live’, in each place we visit. I think we have been guilty of not really seeing all the people around us when we are on vacation. We have our heads down, going about our own business, not really connecting. On this adventure, we often have the time to meet people and experience their home city in a more authentic way. Sometimes we wish we could stay longer and other times we are ever more grateful for our life back home. Whatever the motivation for journalling or the different forms it may take, it is always a positive experience. At least it has been for me, over my life. I’ve written in fits and starts, not keeping to one faithful daily practice. The morning pages is my first time of sticking with it and the benefits are extremely satisfying. What kind of journalling practice has been most rewarding for you? Any special writing tools or journal books? While the content is highly personal, wouldn’t it be awesome to share strategies? Maybe the morning pages is just one of many? Join me in this creative journey. I think it will be worth your time.